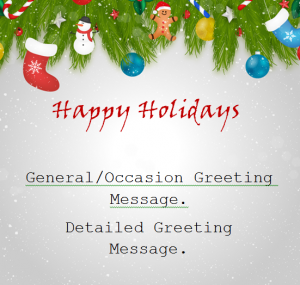 Send everyone that’s important in your life some holiday spirit with this Simple Greeting Card template! Nothing brings out holiday joy and announces your plans better than a greeting card. Whether you want to celebrate this year with a party or simply wish someone a great holiday season, these greeting cards are a fun and simple way to achieve that goal. Just enter your information or a heartfelt message and you’ll be all set to print this whimsical template. Send these wonderful cards out to the people you love this holiday season! After downloading the free document below, simply click on the file to open the template. The Word document only requires a few pieces of information, first, click on the line that says” Your custom greeting message”. Here, you will type a quick and fun greeting that is short and sweet. This could be something like “Hope you have a great holiday!” or something a bit more personal that connects with the person and reflects your relationship. Next, click on the second line that says “Your custom greeting message”. This is where you will type out a longer more meaningful message if you want. You can also list details for a party or event if you plan on hosting one and simply want to invite them to the festivities; the template has multiple uses! When you have everything the way you want and your message is pitch perfect, then click the “File” button in the top left corner of the page and select the “Print” option from the drop-down menu. Your recipient will be delighted to receive such a fun and free-spirited message this holiday season.